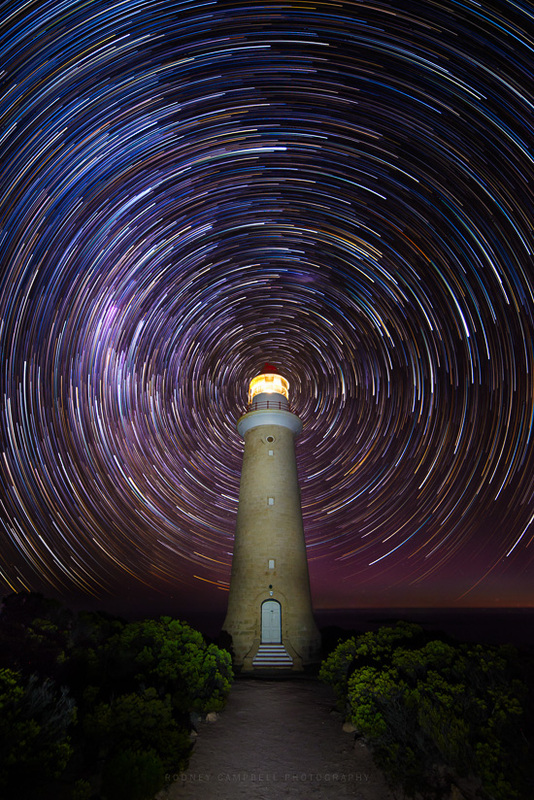 I’d wanted to do some star trails whilst I was on Kangaroo Island – it was the perfect place – super dark skies, nothing to the south of you except Antarctica and no light pollution. Unfortunately most evenings also brought heavy clouds which made it impossible to shoot the stars. On the previous night things almost came to fruition however the clouds soon rolled in. Tonight however was my very last on the island and I was hoping luck was on my side. – the path essentially pointed southward so I knew the centre of rotation of the stars in the sky would be somewhere in this general direction (checking the star app on my iPhone for Sigma Octanis essentially confirmed this). Whilst the app on the phone gives a rough indication, the direction is not this exact. I’d like to say it was amazing planning which ensured the centre of the swirl would be aligned left right with the lighthouse on purpose but that would just be a lie :). – I put my tripod up as high as it would go. I was shooting with the incredibly wide Samyang 14mm f/2.8 prime. I was expecting to shoot pointing a little upwards to include as much of the sky as possible, but I also wanted the lighthouse to remain relatively undistorted so as high as I could go would be better – the path sloping down a little towards the lighthouse also helps. – Finally the distance I setup my tripod from the lighthouse. Again I’d like to say it was perfect planning which placed me in this spot so that the centre of the swirl would also be aligned top to bottom with the light… Alas again that would be untrue – it was a more mundane reason I chose this specific distance from the lighthouse. I needed to be back far enough so the building would remain a good shape but not so far back that the light from the lighthouse would be directly visible to the camera (and blow things out) so I moved back just to the point where the light bulb/source was being clipped by main light room wall itself. Luck obviously favours the – I was going to save “brave” but I think I’ll just go with “insane” :). I then proceeded to take some single shots with some light painting to use as the base foreground image of my final result. Then I worked out what my star trails exposures would be – in this case with incredibly dark skies I settled on 60 sec at f/2.8 and ISO 1250. I setup my programmable intervalometer and let it go. 1) I’m literally in the middle of freaking nowhere… My family were perhaps the only souls within an hours drive and we’re at what almost amounts to the end of the earth. Anyway we proceeded to do some shots for them with a little light painting of the lighthouse (I was going to have to manually edit a bunch of frames and darken the building and the foreground anyway now). I’ve already mentioned some of the post. I performed a number of global edits across the whole set of frames and some careful specific editing of some. I loaded all the frames (109) and stacked them as layers in Photoshop as I usually do. The end result was pretty decent however this time I decided to also try a software package dedicated to stacking star images (StarStaX) for which there is also a Mac version. This software can’t use RAW files so I had to export my edited images as 16bit TIFF’s and import into StarStaX. I tried a number of combinations but in the end the best set ended up being the shorter 92 Frames taken before the clouds came. I utilised the softwares Gap Filling mode (which works remarkably well – you can’t see it so much in this smaller view but zoomed in to 100% you definitely notice the gaps otherwise). I also used the Comet mode which I think for this shorter set adds a nice touch and gives a real sense of motion to the stars.